cluster bombs for ground attack. Including those transferred from No.899 HQ Training Squadron, 12 were scraped together for "Hermes'" No.800 and 8 for "Invincible's" No.801 NAS. Thus 20 aircraft, some piloted by the RAF, had to defend the Fleet against 100 plus Argentine attackers. Only in mid-May were they reinforced by Harriers eight more Sea of No.809 NAS (plus six RAF GR.3's). 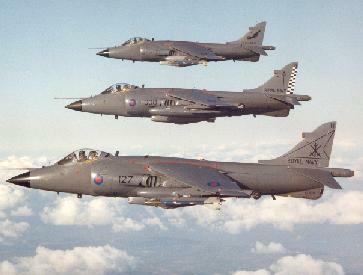 Just six Navy Harriers were lost by accident or ground fire, and not one in air-to-air fighting. 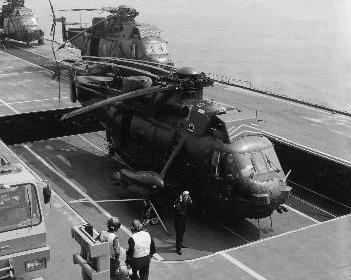 Sea King Mk 5 of 820 NAS on "Invincible"
No.846 - 15 HC.4 Assault, including 9 initially on "Hermes", 3 on "Fearless" and 1 on "Intrepid"